Daily between April-October. April-September ship departs at 4.30pm and 4pm in October. Days when the sea is calm to avoid a choppy ride and sea sickness! We are comparing Pirate Ship Cruise along the Algarve Coast Prices from leading ticket suppliers and Try to find you Cheap tickets prices on the market. Step onboard the beautiful historic Pirate Ship Leaozinho which translates as "little lion" which sets sail (under motor) from Albufeira marina. On the 2 hour cruise you will pass by some of the Algarve's most beautiful landscape scenes with cliffs, caves and grottos and white sandy beaches. Passing by San Rafael, Castelo and Praia da Gale, you might also be lucky enough to encounter the playful dolphins that make their home in this part of the Atlantic ocean. They can often be seen swimming by the boat which makes for a magical experience. A family friendly trip that everyone is sure to enjoy - Grownups can admire the passing scenery whilst sipping on a drink from the bar whilst the kids will adore raiding the dressing up box as they become pirates onboard their very own pirate ship! An enjoyable and lighthearted way to see parts of the beautiful Algarve coast on a short 2-hour round trip. Best avoided if you suffer from seasickness. Your Experience With Pirate Ship Cruise along the Algarve Coast? Depart Albufeira marina in the late afternoon onboard the Pirate Ship Leaozinho on a 2 hour Captain Hook cruise. See some of the most beautiful spots along the Algarve Coast as you sail on the Atlantic Ocean westward towards San Rafael, Castelo and Praia da Gale taking in the stunning scenery of white sand beaches, sea caves and cliffs along the way. Along the way there's also every chance that you'll see playful dolphins swimming in the wild as they swim around the boat - A magical moment that will remain with you for a lifetime. There's also the chance for a swim, walking the plank in order to reach that refreshing crystal clear water. Throughout the cruise the crew will keep you entertained, sharing some pirate stories and the history of this section of the beautiful Algarve coastline as you enjoy the scenery with a drink in hand from the onboard pirate bar. 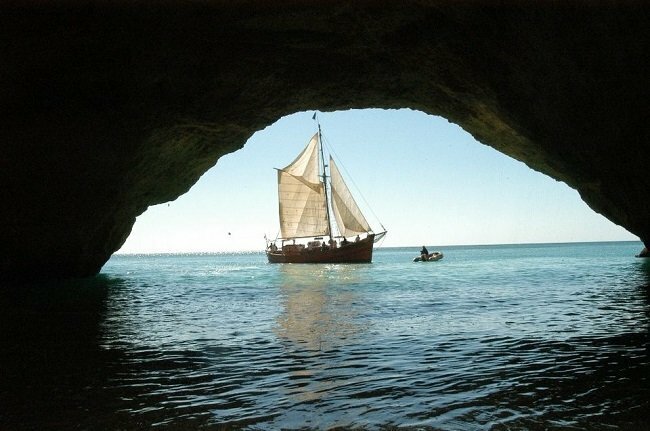 What Pirate Ship Cruise along the Algarve Coast Includes? A 2 hour return boat trip on the pirate ship Leaozinho. See the beautiful Algarve coastline with caves, rock formations and white sandy beaches. Pirate themed entertainment onboard will keep you laughing yet also informed about the coastline. The chance to see dolphins. Sail from Albufeira past Sao Rafael, Castelo and Gale before returning back to Albufeira. Avoid sitting at the back as the fumes might make you feel queasy. Bad weather might mean the trip has to be cut short. Travelers Reviews about Pirate Ship Cruise along the Algarve Coast? For the most part this trip gets good reviews from travellers on TripAdvisor, GetYourGuide, and Viator, the majority of visitors recommending it to other travellers. People say that it was a fun trip with funny and friendly staff and they had a great time. It's highly recommended for kids but adults will enjoy the scenery they pass on this light-hearted boat trip. Some passengers reported a lack of commentary meaning they didn't know what they were passing. A few people were disappointed saying it was boring, also, quite a lot of passengers experienced sea sickness so do make sure you have your sea legs with you!! Printed tickets and e-tickets accepted. Receive instant confirmation when you book online. Wear your swimwear under your clothes for the chance to swim in the crystal clear water. Arrive at the marina at least 15minutes before scheduled departure.